Email is definitely one of the few online tools available for marketers to promote their products and services. Emails boost traffic to your site, supplement your content marketing efforts, and generate more ROIs than from social media sites such as Facebook, Twitter, and Google+. In today’s post, we will discuss the most important email that you will ever send out to your audience once they subscribe to your email list – i.e. your welcome email. Welcome emails are the first email sent to your subscribers once they submit their e-mail address. According to the experts at Epsilon, welcome emails often have the highest open rates than any other marketing emails – up to 50 to 60%. Moreover, customers that receive welcome emails are more likely to get engaged with the brand than those who do not send out one. Perhaps, this is the biggest reason why you should send welcome emails to your new subscribers. To make everything easier for you, we have compiled 7 awesome welcome email ideas that will make your emails as best as they can ever get to be. “One of the key objectives of sending a welcome email is sending a warm introduction to your new subscriber,” says Tiffany Romero, the president of a content marketing firm, Sway Group. If there are additional step(s) that you’d like your visitors to perform, such as confirming the subscription, you could include a call to action like the one sent out by Zulily, an e-commerce company selling clothing, toys, and home products. 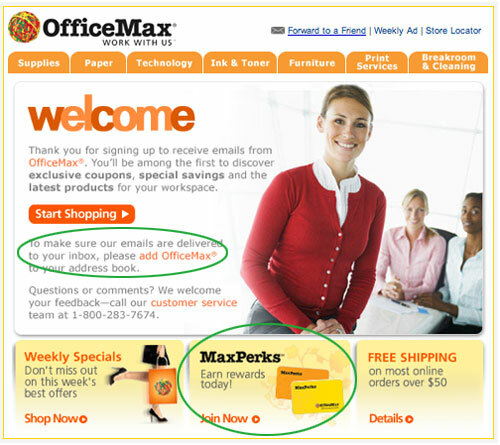 You can also use welcome email to inform your new subscriber what to expect from your business. For example, if they opt-in reading your blog, thank them for subscribing to your blog, just like the one sent by the Zapier blog, a productivity, and workflow automation company. 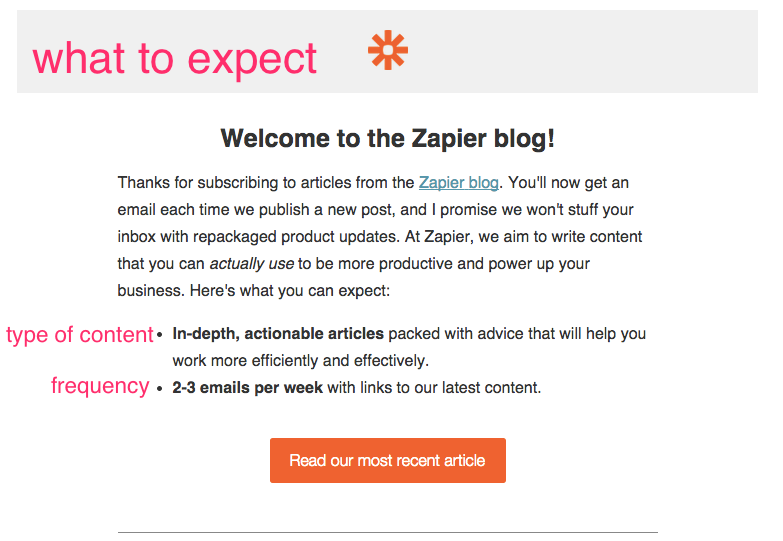 Let your subscribers know what to expect –and email every time you post a new blog in your site. Also, mention what they will not get, adding value and trust among your new subscribers. To drive more open-, read-, and click-through rates, put focus on your customer, rather than on your business. Send blog posts to help your customers become more productive and boost their revenues. You can also inform the type of content your subscribers will get. For example, inform them you will be sending useful and actionable articles (tip, tricks, “how-to” guides) that will help them become more productive and efficient at work. Also, mention the frequency of the emails (2-3 times per week) with links to our latest content. Finally, include a link to your most recent article. It is always a good practice to highlight the subscriber’s decision to sign up for your email list. One of the easiest ways to do this is to offer them quick lists of benefits, perks, and bonuses, which lets them know why signing for your mailing list was a great idea. Backcountry does a great job of telling their subscribers who they are, what they offer, and explains what their subscribers can expect – sales, exclusive email discounts, backcountry news, and feature articles, etc. 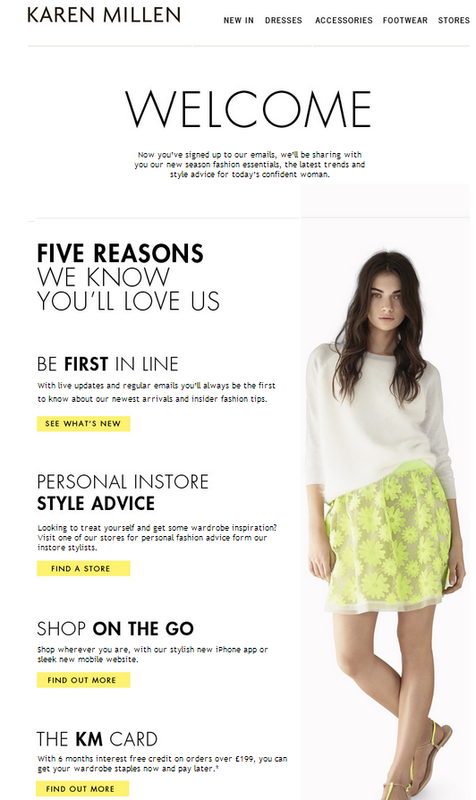 Karen Millen, in the example below, gives 5 reasons “why their subscribers should love them for being their member.” The Karen Millen newsletter is a good example of how to articulate the benefits. In order to create a goodwill among your new subscribers, you can also offer discounts or some sort of gifts in your welcome emails. It will motivate them to take action – purchase a product or book a service. 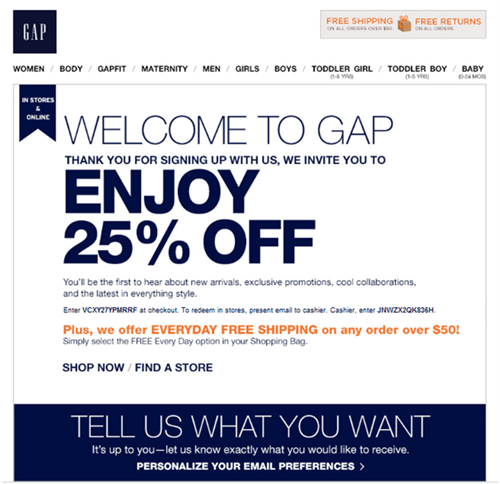 The GAP, a clothing and accessories retailer, welcomes and thanks its new subscriber by giving them a special 25% discount for just signing up for their list. Also, they offer FREE everyday shipping “for any order over $50!” as a welcome gift. It is a small incentive, but it can benefit both the company as well as the new customer. As you greet your new customer, it is fine to display your products and services up front and center. After all, your new subscribers signed up to learn more about you and your brand, right? So, give them exactly what they are looking for. An awesome welcome email has to look good and display properly … on mobile devices. This is because many mobile users (almost 79% Smartphone users) use their devices to access emails, as mentioned in the Adobe’s Digital Publishing report. The report also confirms that Smartphone users are more likely to use their phones to access emails than making calls. So, this makes it even more important to create a mobile-friendly version of your welcome emails. Make sure all your emails are responsive so that they look and function properly on all mobile devices. 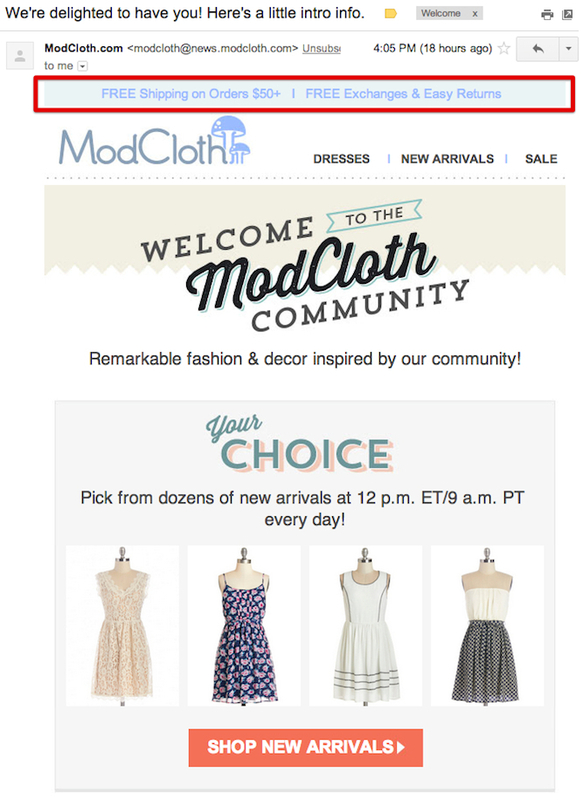 “Every welcome email should have strong, clear, and concise calls to action,” says Romero. 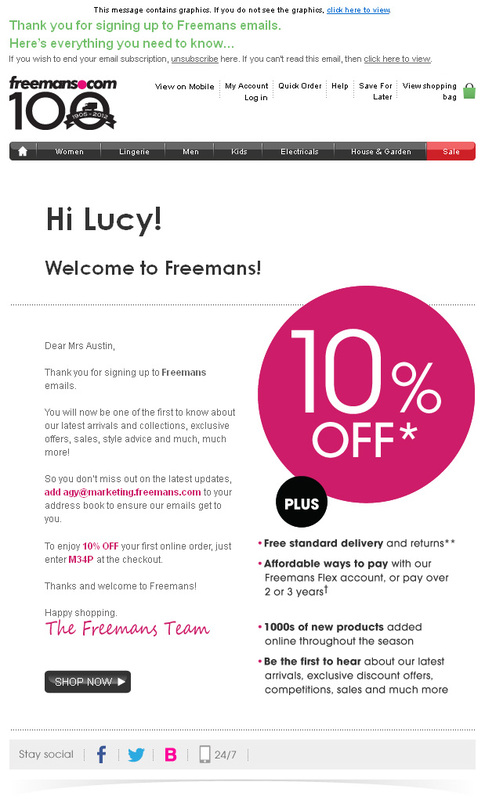 The welcome email example below is not only effective because of its design and promotional offers, but because of its simple yet effective calls to action button. Did you notice how it stands out from the rest of the welcome email? 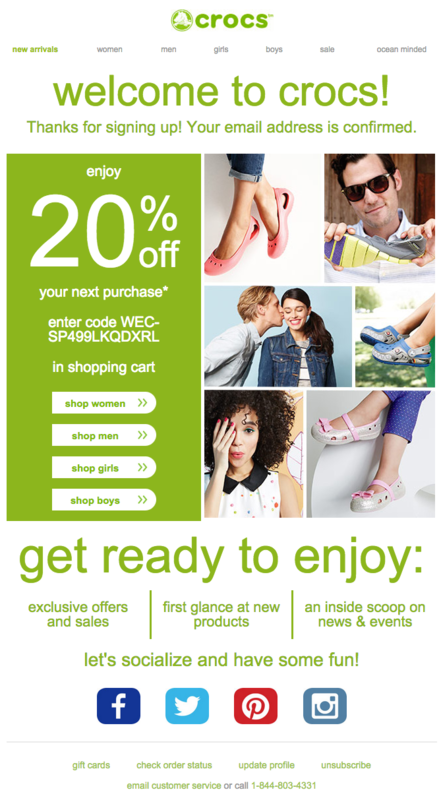 The color of the button makes it stick out, which also complements the overall email design. The use of button over text makes it prevalent. It also informs about the important stuff – “new arrivals” – inspiring the recipients to act. Adding your social media buttons is another crucial component of a highly effective welcome email. Your new contacts are highly interested in learning more about your brand. Otherwise, they would not have signed up for your email list. Engage them by sharing the URLs to your social media sites. Look at this welcome email example below. Look how Freemans, a British catalogue clothing retailer, have placed social media icons to their company blog, Facebook, and Twitter accounts. Using social media sites in your welcome emails gives your subscribers additional ways to contact and interact with your business. Now, you can create awesome welcome emails with these seven examples.